Trees are manipulated via a series of molds into furniture on Full Grown Ltd's Derbyshire farm. 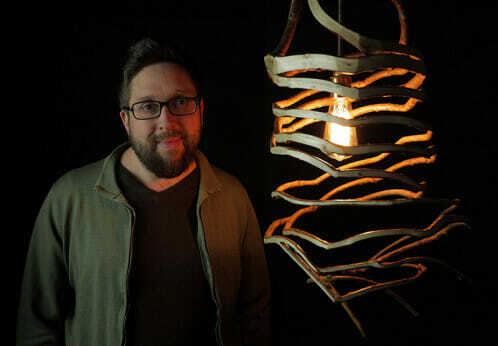 British furniture maker Gavin Munro stands with a lamp he grew. The 39-year-old calls it “botanical manufacturing” and it’s happening right now in a 2.5-acre field in Wirksworth, Derbyshire, England. There, willow, oak, ash and other tree varieties are being coaxed via a complex system of molds into taking on various shapes that will end up as furniture made without nails, glue or joins of any type – they will be connected via tree grafts. After the furniture is harvested, Munro says the trees will again sprout new shoots and “continue to have a life,” and could be used again to grow more furniture. “We think this method is kinder and less wasteful than planting a monocultural plantation of trees (with all those implications for biodiversity), growing for a specified lifetime, then chopping down, leaving an uncared-for, cleared area, with all the additional problems like desertification,” he tells Modern Farmer in an email. He says it “makes more sense to grow trees directly into objects” since what we desire is “the beauty of wood.” He questions the practice of “growing trees for 60-plus years only to chop them up into little bits.” By bypassing the many processes that typically go into making furniture, Munro believes his company is about 75 percent more energy efficient than the traditional model. “It’s early days, but it certainly appears to be considerably more sustainable,” he says. It may be more sustainable, but Munro admits it’s a lengthy and time-consuming process. His willow chairs (which grow fast by tree standards) take between four and five years to complete, while an English Oak chair could take up to a decade. With one full-time and one part-time employee and a lot of work (100 trees have 1,000 branches that need to be cared for and 10,000 shoots that need to be pruned at just the right time, he says) Munro sometimes gets friends and family to help by plying them with his chili and cornbread, recipes he mastered while living in California. Perhaps Munro’s ability to be patient had its roots in a childhood in which he spent a good deal of time recovering in bed after corrective spinal surgery. “There were long periods of staying still and looking between all the people and the trees out of the window and plenty of time to observe everything going on and reflect,” he says. Munro says they currently have 3,000 trees, but believes they will eventually thin down to about 1,500. So far they have only harvested the prototypes for the chair, pendant lamp and side table, but a batch of pendant lamps and mirror frames will be coming this year and will be ready for purchase by next spring. Chairs, floor lamps and some tables will be available by the fall of 2017. “Theres also a prototype chair we’ll harvest this fall, too, and maybe, just maybe, a few other surprises,” he tells Modern Farmer. The limited number of his designs means that the furniture won’t come cheap. Pre-orders range between $700 for a mirror to $4,000 for a first-edition willow chair. He says while his company is the first to make furniture this way and on this kind of scale, there is a long history of growing furniture that goes back to the ancient Chinese, Greeks and Egyptians, through the early 1900s when John ‘Dammit’ Krubsack planted the ‘Chair That Grew’ in Wisconsin, to the 1940s, when Axel Erlandson created a roadside attraction in California. Erlandson called his creation “The Tree Circus,” and it featured a variety of trees he had shaped into intricate designs. Munro says there are other people practicing this craft today, including Christopher Cattle and Peter Cook and Becky North. Cattle directly inspired Munro’s work, he says. There’s also Richard Reames, an “arborsculptor” from Oregon who creates “living” chairs and benches from trees. Like many innovators of the past, Munro has received his fair share of naysayers who thought he was off his rocker (yes another intended pun, but this one is furniture-related). “Plenty of people laughed at me – a few still think I’m crazy, but more importantly, some folk have gone full-circle and are now advocates,” Munro says.